Need each charger circuit to have 2A available whenever needed but cant figure out which buck converter/voltages/input current I need? Im not fussed about exact voltages once its within range of the Ardunio (5v-12v) and chargers (4.5v-9v) of course. Edit: According to this and taking into consideration 80% efficiency, it seems my application would need a 12v plug that delivers at least 1.04A for a buck converter to step down to 5v 2A output. Does this seem correct? If it is then I guess the only question left is will any old buck converter that is rated for 2Amp or more be suitable? No, It can output 3A with carefully heatsinking. "will make " or "will consume "? As you can see, the efficiency is about 80 % if input voltage is 12V. The only problem is if your 12 V adapter can provide enough wattage for your load. Not the answer you're looking for? Browse other questions tagged power-supply dc-dc-converter components step-down or ask your own question. 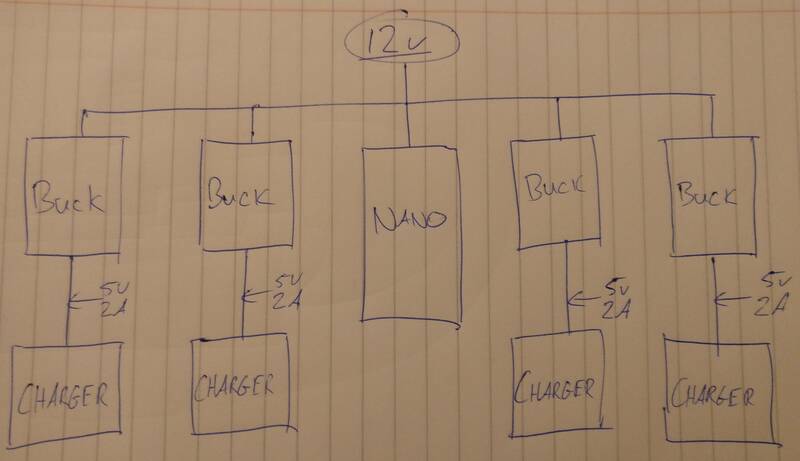 Making A USB Charge Cable (to replace 2.4V power supply) - Buck Converter? Is this a suitable common mode choke?